I love love love pad Thai. Every time I go to a Thai restaurant, I always want to branch out and try new dishes, but I invariably gravitate back to pad Thai. This dish is a balance of tangy, sweet, spicy, salty, and sour flavors, which are very characteristic of Southeast Asian food. 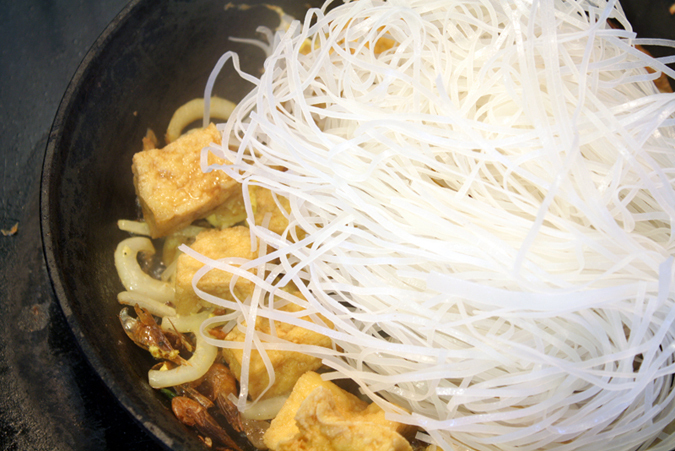 Rice noodles are a staple in Asian cuisines and come in a variety of shapes and thicknesses. 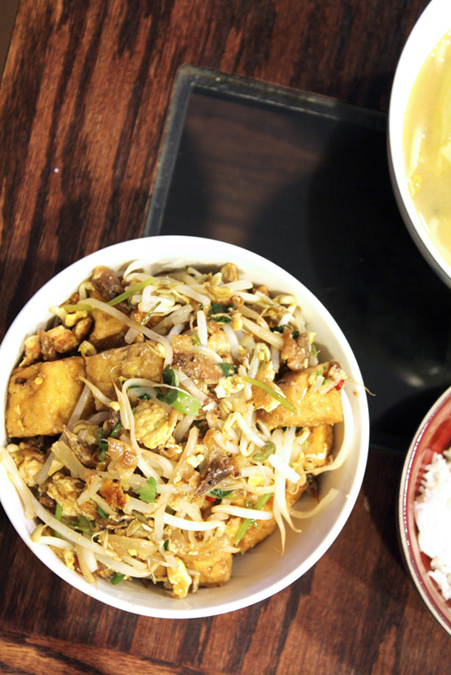 For this dish, you’ll want to use pho noodles, which are very common in Asian marts. The noodles can be fresh (which can be found in the refrigerated section) or dried (on the shelves). The ingredients list should be short: rice flour, water. Dried shrimp are small shrimpies that have been dried in the sun. They have their shells still on (and the shells are very thin and totally edible). They are packed with salt, shrimpy, and slightly sweet flavors, which are great when soaked in soups. Deep fried tofu cubes are made from cut-up firm tofu that has been deep fried. You can certainly make your own at home and use them in this recipe, especially if you’re very keen on making this a gluten free recipe, as some fried tofus at the market are battered with flour. Palm sugar is magic sugar. (Okay, it’s not really magic.) Its flavor is not as “straight” as white granulated sugar. Palm sugar is sticky and often sold in hunks. To use, just chip off a bit off the brick and either break it down with a spoon a little or dissolve in a liquid. Tamarind paste comes from the pod of a tamarind tree. It has a complex savory sourness with a slight sweet finish. These are sound in markets in bricks or in jars. I’ve only had experience with the brick (you break off sticky, sticky hunks and soak in a little boiling hot water until the pulp separates from the seeds and fibers. You’d them strain the pulp liquid before using). But I hear the kind in jars (in which seeds and fibers are removed) is quite good. Avoid any tamarind items that come in a powder form, as they don’t really taste like tamarind. Mix palm sugar and tamarind pulp in fish sauce and set aside. Lightly beat eats in a small bowl. Gather and prepare the rest of your ingredients and set it nearby. This process will go fast. In a screaming hot skillet or wok (so, super high heat), add vegetable oil and swirl it around a little. Add in dried shrimp and stir around a little to coat in oil for about 5 seconds. Add in onions, garlic, and chiles, stir for 5 seconds. Pour in beaten eggs and scramble lightly for about another 5 seconds. 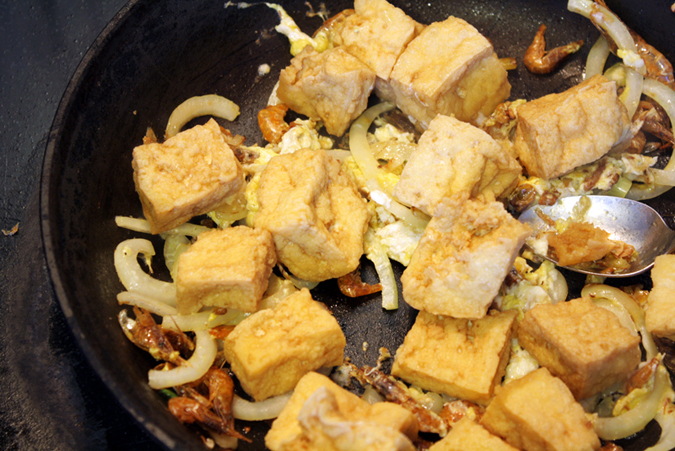 Add in fried tofu cubes and toss around with a spatula for a few seconds. Take rice noodles directly from the water it's been soaking in and add to pan. It's fine (and encouraged!) to drip some of the excess water into the pan. Toss with the rest of the ingredients and add the fish sauce, tamarind, and sugar mixture. Stir vigorously for 30 seconds. Lower the heat to low, move the pan off the heat source for a moment, and cover it with a lid to let the noodles soften and cook and absorb all the awesome flavors. Unlid it, put it back on the heat, and add half of the sprouts. Mix. Pour the tofu pad Thai into a serving bowl and top it with peanuts, green onions, cilantro, and the rest of the bean sprouts. Serve and enjoy! 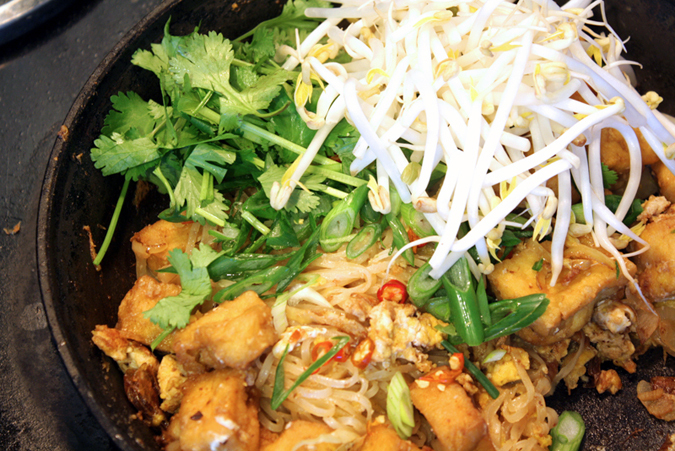 While this tofu pad Thai is vegetarian-friendly, it may not meet the requirements of the strictest of vegetarians. To make it vegetarian (and vegan!) you can omit the dried shrimp and substitute the fish sauce for vegetarian fish sauce. Vegetarian fish sauce is a hit and miss so experiment. I don’t recommend substituting soy sauce, though. Good luck!